SAN FRANCISCO – July 12, 2010 — Spurred in part by the rising popularity of Windows 7 features like Touch and Multi-Touch technology, more software developers are developing applications for Windows 7, according to a recent survey conducted by Embarcadero Technologies. More than half of the software developers surveyed – 54% – indicated that they are currently developing applications for Windows 7 and another 25% said they plan to start developing Windows 7 applications in the next year. Of those who are currently developing for Windows 7, the majority said they started within the past six months to one year. Meanwhile, 10% said they have no plans to develop Windows 7 applications. Enthusiasm for Windows 7 development is being driven, in part, by developers’ eagerness to include popular features like Touch, Multi-touch and enhanced graphics into their software. 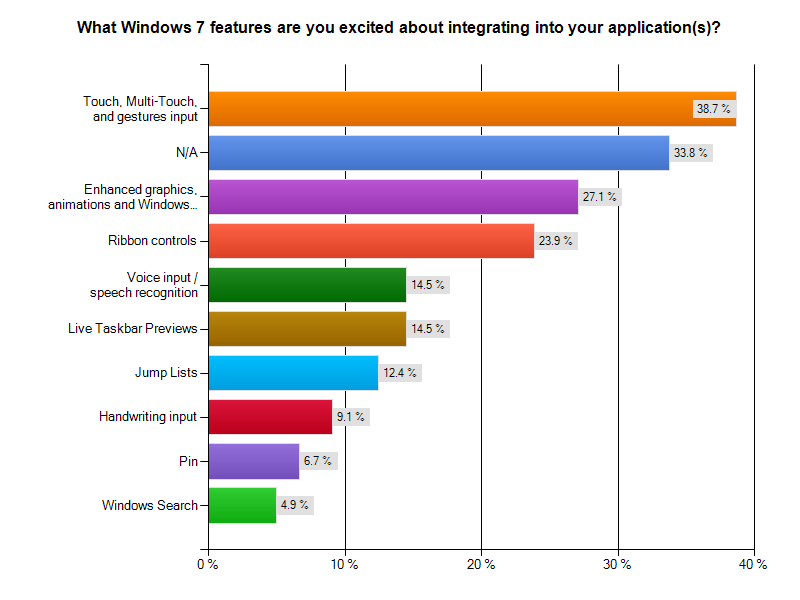 When asked which Windows 7 features they are most excited about integrating into their applications, nearly 40% said Touch, Multi-touch and gestures input, while 27% said enhanced graphics, animations and Windows Imaging Component. and 24% said ribbon controls. Respondents were more lukewarm about multimedia features such as Windows Live Movie Maker and Internet TV. “The popularity of devices like the iPhone and iPad have helped drive mainstream acceptance of Touch-based technologies. This popularity transcends into the developer community and I doubt we’ll see it abate anytime soon,” said Michael Rozlog, product manager for Delphi Solutions at Embarcadero. Not surprisingly, 34% of respondents indicated that the biggest challenge with developing Windows 7 applications is being able to support users on older versions of Windows. Microsoft is ending support for Windows XP in April 2014 and many analysts are encouraging enterprises and consumers to switch to Windows 7 by the end of 2012, although their urging has been met with some reluctance. That speaks to the next biggest challenge cited – more than 15% of developers said they are waiting for more organizations to adopt Windows 7 to make it worth their while. The survey was conducted in May 2010 by Embarcadero Technologies. The 606 respondents were a mixture of developers, architects and analysts.